$5.5 Million Dollar World Record | Fitz Henry Lane Painting | Skinner Inc. This post continues a series of stories behind some of the top highlights in Skinner auctions from the past decade. Through telling these stories, we hope to shed light on where the market has been and where it’s going now. a name change to Fitz Henry Lane. Whether you call him Nathaniel, Hugh, or Henry, the artist probably saw the works of Robert Salmon and Washington Allston in Boston in the early 1840s. It was at this time that he decided to concentrate on painting. The paintings of the late 1840s and early 1850s reflected Lane’s earlier graphics training, in conjunction with the influence of the marine artists of the earlier generation. As is apparent in Manchester Harbor, the foreground details with its figures, piers, and spits of land, the scale for the work while accentuating the vastness of the view and its light. The low placement of the horizon line allows for an expansive sky. Tinted with the warm hues of sunrise and reflected in the calm waters, the light becomes the focus of the work, as is typical of Luminism. The horizontal arrangement of the composition creates stillness in spite of the great, varied activity of the foreground. 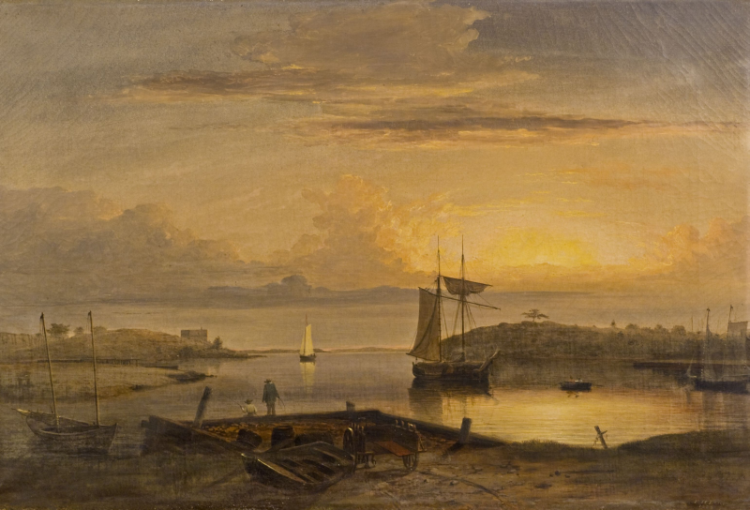 In conjunction with the concentration of light around a sun viewed through clouds just above the horizon, Manchester Harbor foreshadows the increasing calm and poetry of Lane’s mature Luminist style as it would emerge in the late 1850s. From my experience as an appraiser of fine paintings and prints for Skinner and on Antiques Roadshow, I know how rare it is to find a masterpiece like this one. Every time I sell a fabulous painting at auction, I wonder how many more there can be left to find? But I know there are many more amazing finds out there. If you have an exceptional painting or print by a well known artist, and would like me to take a look, please call and set up an appointment at 508-970-3299. This entry was posted in Blog and tagged appraiser of fine paintings, auction highlight, Auction Highlights, auction record, boston auction, Fine Paintings, Fitz Henry Lane, million dollar world record, new england auction, painting auction, robin starr, world record by Robin Starr. Bookmark the permalink. I HAVE SEVERAL PRINTS AND PAINTINGS I WOULD LIKE YOU TO LOOK AT.SOME OF THE PRINTS ARE NUMBERED AND OTHERS ARE NOT. THERE IS A PRINT OVER 100 YEARS OLD. ALSO, A CIVIL WAR VETERAN J.STEEPLE DAVIS HAS A PEN AND INK OF A PRIVATE SHIP. THERE ARE 3 OR 4 OTHERS. PLEASE ADVISE I CAN TAKE PICTURES OF THEM IF YOU WISH. Thanks for this informative piece. I was surprised to learn that the man had so many names! Of course this lends to this curiosity: are his signatures as diverse? Pingback: The Robert Bunting Dance Collection | Prints, Photography, Paintings, Sculpture | Skinner Auction 2673B | Skinner Inc.
Pingback: Fitz Henry Lane Auction Results | Skinner American & European Works of Art Auction Grosses $3.2 Million | Skinner Inc. I have a F. H. Lane, dated 1853, Boston Harbor. It is a oil on canvas. It shows a State House in the background.